Dr. Garcia is the Surgeon in Chief for Dell Children’s. She also holds an academic appointment of Associate Professor of Surgery & Perioperative Care with Dell Medical School at the University of Texas at Austin. 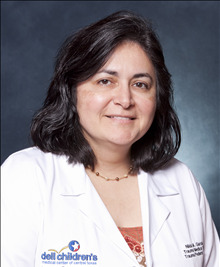 She is active in the field of pediatric surgery and pediatric trauma. I am passionate about pediatric surgery and pediatric trauma. I enjoy all aspects of taking care of a child. Seton Family of Doctors currently participates with various insurance plans. Insurance listings are subject to change without prior notice. Please contact your provider to verify participation prior to scheduling your visit. The Surgeons at APS perform minimally invasive surgery for many procedures. These procedures are performed through small incisions instead of one large incision. Children who have had minimally invasive surgery tend to have quicker recovery times and less pain than with conventional surgery.